The first large-scale simulation of blood flow in coronary arteries enlists a realistic description of the vessels’ geometries. Researchers reported on the simulation today at the SC10 supercomputing conference in New Orleans. Heart disease is called the silent killer. Heart attacks occur in people who had no idea that deadly plaques lurked inside the tree of arteries that feed that life-sustaining muscle. Because the medical tools that can measure and predict these problems involve expensive, painful and invasive tests, doctors want less invasive ways to tease out factors that put a patient at risk. Computational science provides one way to better understand blood flow in this complex biological system. 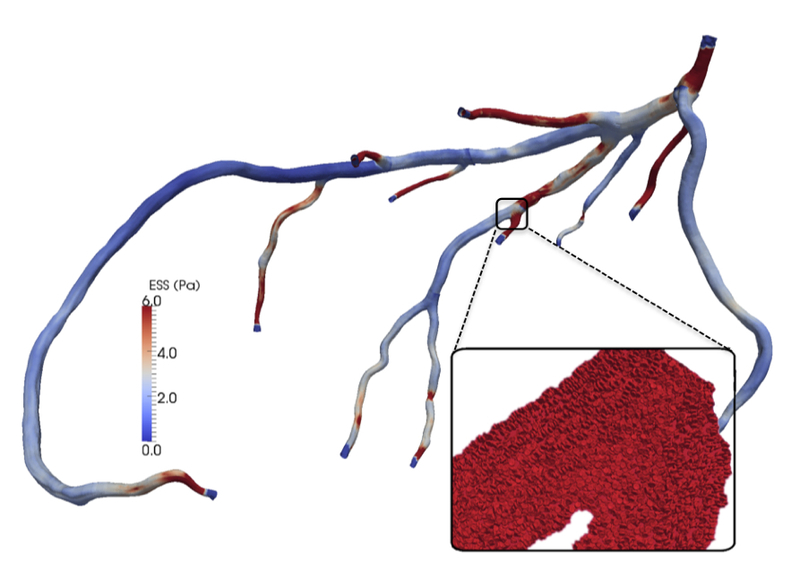 In research presented today at the SC10 supercomputing conference in New Orleans, a Harvard University-led team describes the first large-scale simulation of blood flow in coronary arteries. The simulation uses a realistic description of the arteries’ geometries, and it accounts for fluid flow and the shape and movement of 300 million red blood cells through this system. This multiscale simulation was carried out on the nearly 295,000 processors of the IBM Blue Gene/P system. The research is a finalist for the Gordon Bell Prize, awarded each year at the conference. One goal of these simulations is to calculate the force – the endothelial shear stress – along the walls of the coronary arteries as blood flows through. Research suggests that such forces play a critical role in forming arterial plaques that lead to ruptured vessels and heart attacks. “The only way to really determine the shear stress for a patient’s heart is to run a simulation like this,” says first author Amanda Peters, a recipient of the Department of Energy Computational Science Graduate Fellowship and a Harvard applied physics Ph.D. student. The work, which requires expertise in physics, parallel computing methods and visualization, has grown into an interdisciplinary and international partnership to look at blood flow through the coronary arteries, says Efthimios Kaxiras, Peters’ advisor and John H. Van Vleck professor of pure and applied physics in Harvard’s Department of Physics and School of Engineering and Applied Sciences. Kaxiras developed the original project with Sauro Succi, the research director at the Istituto per le Applicazioni del Calcolo (IAC) of the National Research Council of Italy. In the current study, Peters collaborated with Simone Melchionna, now a senior research scientist at the National Institute of Condensed Matter, Italy, and collaborateur scientifique at the Institute of Materials at École Polytechnique Fédérale de Lausanne (EPFL); and Massimo Bernaschi, IAC chief technology officer. Other co-authors include Mauro Bisson, IAC; Jonas Latt, EPFL; and Joy Sircar, Harvard. Calculating the geometry of coronary artery fluid flow is far more complex than it would be if the arteries were straight tubes, Peters says. The computational mesh of data points designed to emulate the system has to be small enough to account for the subtle kinks and branches of the 12 arteries that feed the heart. The resulting simulation was at a resolution of 12.5 microns, just larger than the average red blood cell, which led to a billion fluid nodes. The simulation looked at these effects for about 1 second, the length of an average heartbeat.